A superb run with five wins and a draw in six games; by most standards that is a compelling argument for consistency. 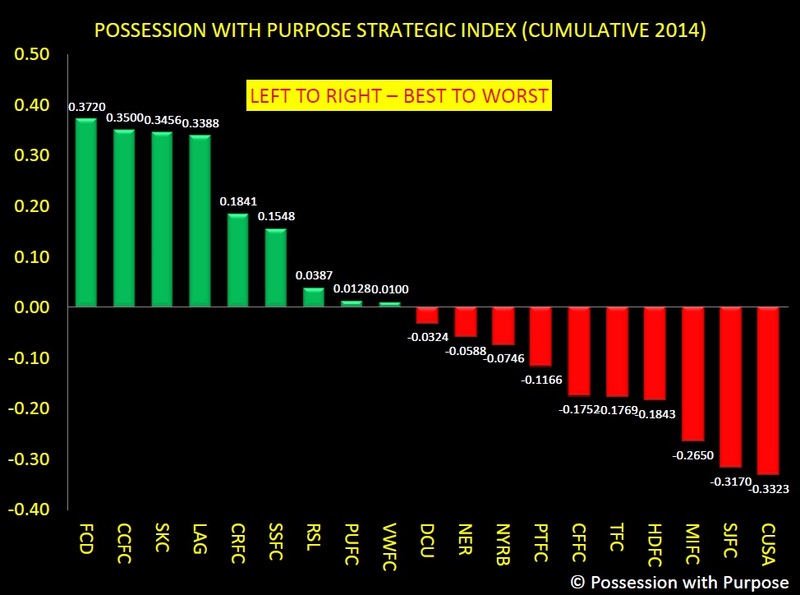 I agree and their overall Composite Possession with Purpose Index rating continues to climb. They've (New England) climbed from 17th in PWP (week 5) to 7th after week 11; a superb shift of 10 full places in 6 weeks. So in considering this giant push forward I'd like to take a different approach in how the data points from PWP can be viewed. Below are a number of diagrams referencing my PWP indicators for a few teams; the diagram being used this time is the 'doughnut' diagram from Microsoft Powerpoint. The interesting thing about this diagram is that it allows me to offer up a view on my PWP data points that isn't relative to the exponential relationship (a line). Instead, it allows me to picture the overall tenor of PWP data points in relationship to themselves as being a part of a 'whole'; with the 'whole' being PWP. I feel confident I can take this approach since my Expected Wins 2 correlation for my data points is ~.97 (R2) --- as near to rock solid as you can get. Reminder in case my explanation was a bit wordy above - the percentages indicated in the doughnut are not the percentages of those activities relative to the game; they are the percentage of those activities relative to each other with 100% being all those activities added together. For the future I will check into these three areas when looking to see if a 'direct attacking approach' can be better differentiated from a 'ground-based' (short passing scheme) approach. I did ask Matthias Kullowatz about the specific shot data for New England and Montreal; ~60% of Montreal's shots on target have come outside the prime scoring zones 1 & 2 while ~68% of the Revolution shots on target have also come outside of zones 1 & 2. So what's different? I think it's down to time and space again; though it could be the Revolution have better strikers - but when you see the DC United doughnut diagram a bit later I think it's back to time and space; and with fewer shots taken and more patience in the final third that seems reasonable to me. Notice no 'gold stars'; why? Because there really isn't that much difference between how these two teams execute the six steps of PWP. What separates these two teams in the league table are individual mental mistakes in defense - Portland sit on ten points while Seattle have 25. Through the course of this year the Timbers have dropped 7 points due to red cards and penalties - they did both against Columbus Saturday night! All told things went pretty well for Columbus, a red card by their opponent, a foul in the penalty box by their opponent for a PK and a deflected own-goal by their opponent. If I were a Columbus fan I'd be pretty pissed they didn't win - bad luck for the Crew! However viewed I'll revisit this diagram later when the Cascadia Cup battle heats up. So here's the doughnut view of New York compared to DC United last year and then a bit further down how they look compared to each other this year. 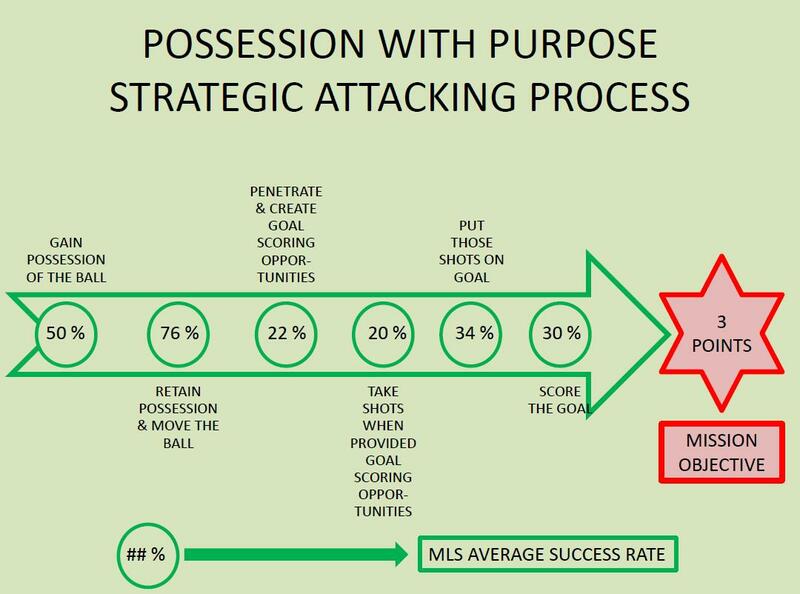 First off - let's not forget Ben Olsen was not fired and perhaps this doughnut diagram can also help explain why given the overall poor performance in results last year for DC United. So I'd offer that the system Ben Olsen ran last year worked - what he lacked was a pair of good strikers. 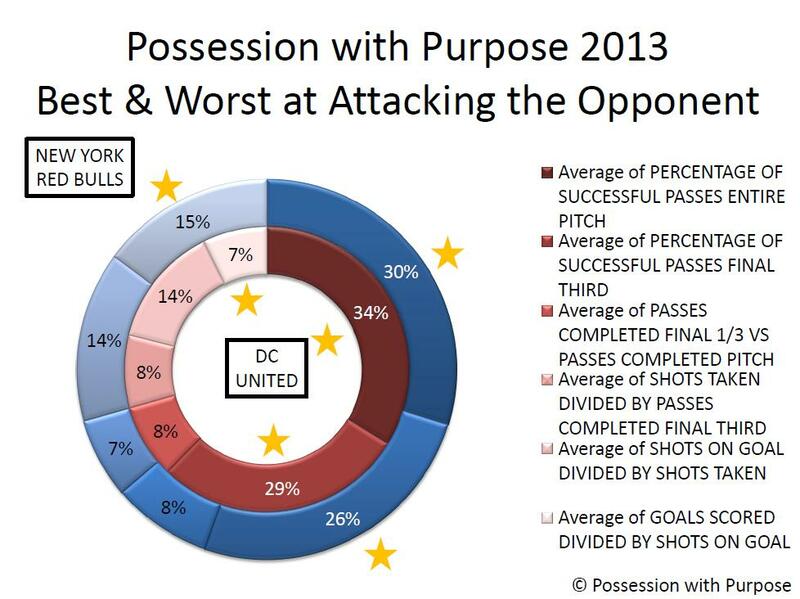 And if you recall the Montreal doughnut earlier the outputs from DC United do not mirror those of the Impact! Note the increase for DC United in the final category - goals scored versus shots on goal - pretty compelling information to reinforce that the system used last year is the same system used this year and the difference - major difference - is the addition of two quality strikers. I'm just in the learning stages on how this new doughnut diagram will take shape - I'm pretty sure it will have at least one hole in it - I'm hopeful there aren't a lot more. Some changes afoot with OPTA and MLS - I see OPTA incorporated the Final Third Passing Accuracy suggestion - just need to find out if crosses are included in that metric??? 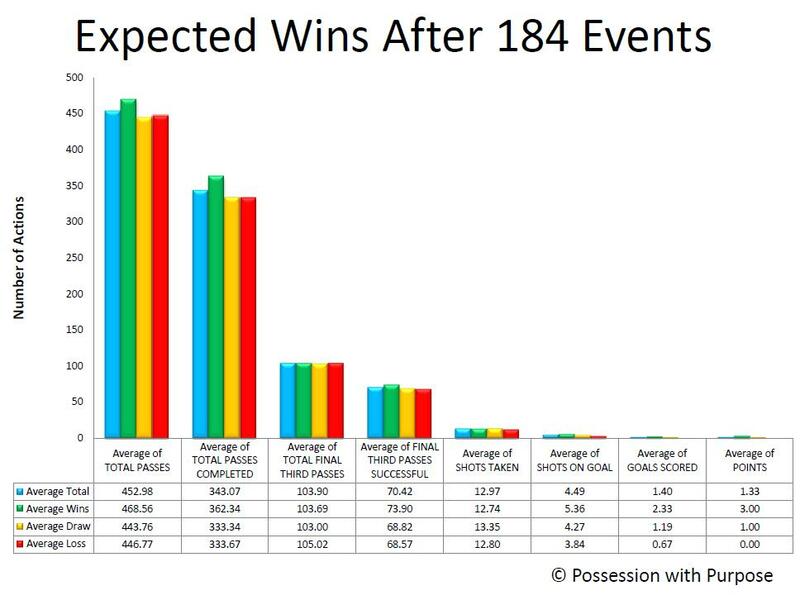 Hopefully most of you read Part I of my series on Expected Wins in Major League Soccer. 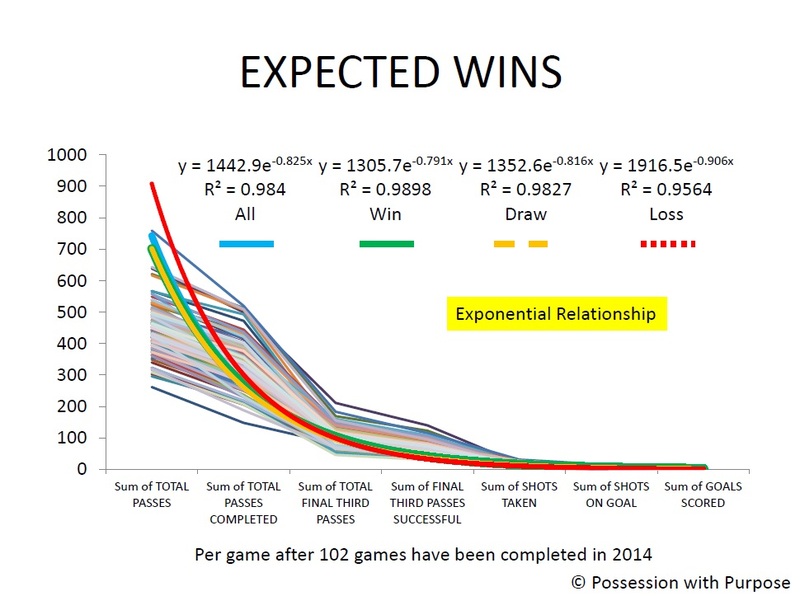 As a quick reminder the Expected Wins analysis is my internal data quality review on the seven data points I use to support my quantitative Possession with Purpose analysis; the stronger the correlation these data points have the more confidence I have in the overall Indices that are created to assess team performance. For me that's pretty cool as it indicates this analysis is not really biased towards teams that use a shorter-passing scheme in attack. Week 5, 3 of 5 teams were under 50% and the other two were both under 51% possession. Some of those teams are possession based teams like DC United, Portland and Seattle but in that week the margin of possession did not have as much effect as the ability of those teams to finish quality chances - the top three teams that week all scored goals equal to their shots on goal. Moving on after that tidbit, here's the averages for overall (blue bar), teams that win (green bar), teams that draw (orange bar) and teams that lose (red bar). The overall tenor of the data points and their relationship really hasn't changed that much since XpW 1. Losing teams still continue to take more Shots than winning teams; 12.74 (winning teams) to 12.80 (losing teams) but... that gap has dropped since XpW 1 - perhaps losing teams are looking to be more patient in their shot selection? The light shaded lines are the lines of data as in XpW 1 - and the trend-line colors remain the same. This time the R2 has dropped just a tad.98 to .95 - all things considered most would consider that correlation Rock Solid... I do - and the correlation of these data points, viewed as a whole, have a higher correlation together than Goal Differential (R2 = .88) to Points in the League Table. Like last time there remains a difference in the R2 between winning teams, teams that draw, and losing teams; with draws now having greater correlation than wins. Why? I'm not sure - but as noted by the closeness of all the data points there still remains a fine line between winning, losing and drawing. Last time I felt that helped explain the difference between mistakes or unlucky breaks - I continue to sense that is the main difference. So might this be an indicator of luck - I don't know - what do you think? I have seen discussions of late, on Telly, and in some articles written elsewhere, that focus more on 'space available' as opposed to just Shots Taken... hopefully that trend continues! I also remain hopeful that OPTA and other statistical web sites will offer up more critical events taking place in the Final Third... One other article written since XpW 1 is my analysis (as promised in Xpw 1) on defensive indicators; here's a link to Hurried Passes and those details. I still don't have enough data, in my opinion, to offer additional thoughts on individual team performance relative to home and away games; that probably won't have statistical reliability until the midpoint of the season (game 323 - events # 646). There are trends but I'll save that for another article, enough for now. So how exactly did that powerful attack look compared to other four-goal outbursts this year - was it really that special? Tops in shots on goal compared to shots taken was Vancouver at 71.43%; and finally... tops in goals scored vs. shots on goal was FC Dallas at 100% versus Houston. So while Houston did well this weekend, and got their second four-goal game, it wasn't dominating compared to others - sorry Houston. It was three points (which is the target) but it wasn't really that special when viewing who you played against... more later on just how weak Chivas are in Possession with Purpose. 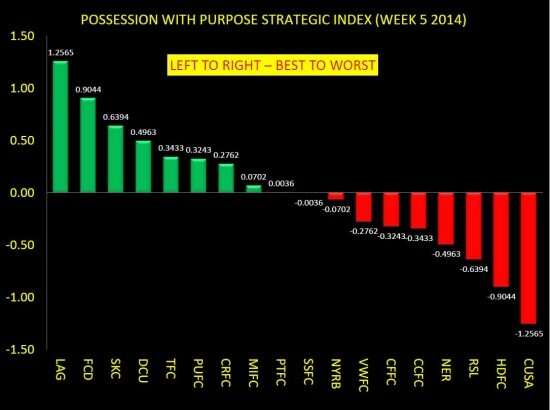 However viewed, Houston still had the best attacking outcome this week. 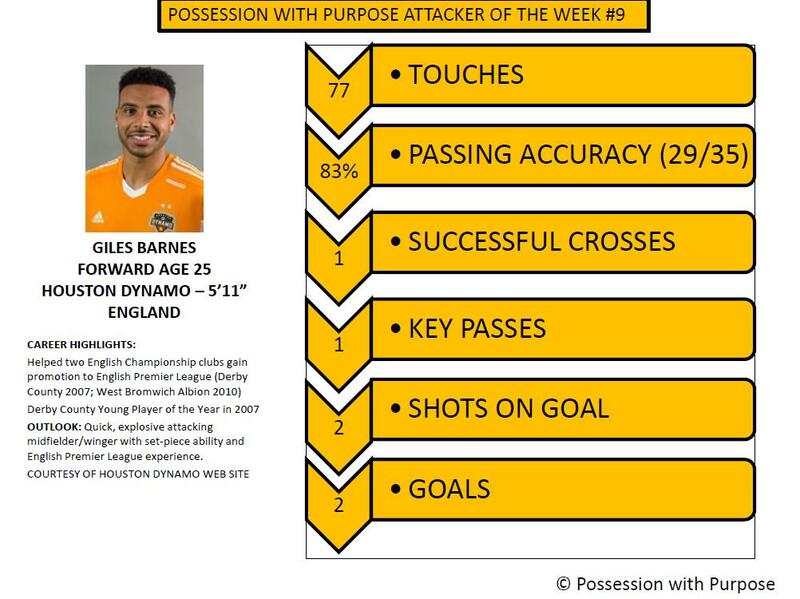 So here's my PWP Attacking Player of the Week... Giles Barnes. Moving on to the Defensive side of the pitch - FC Dallas saw red this past weekend and it wasn't just their kit, the Red Bulls kit or Dax McCarty's hair - it was Watson (elementary my dear) who got red. Things don't get better for Dallas either - they travel to Seattle for a midweek clash this Wednesday and then must fly down to San Jose for another on Saturday... wow. Might we see Dallas drop three in a row? I'm not sure and if you want to know my MLS picks for this week check here. FC Dallas and Chivas USA lead MLS having received Red Cards in four games. But here's where the more later comes in for Chivas - check this out. 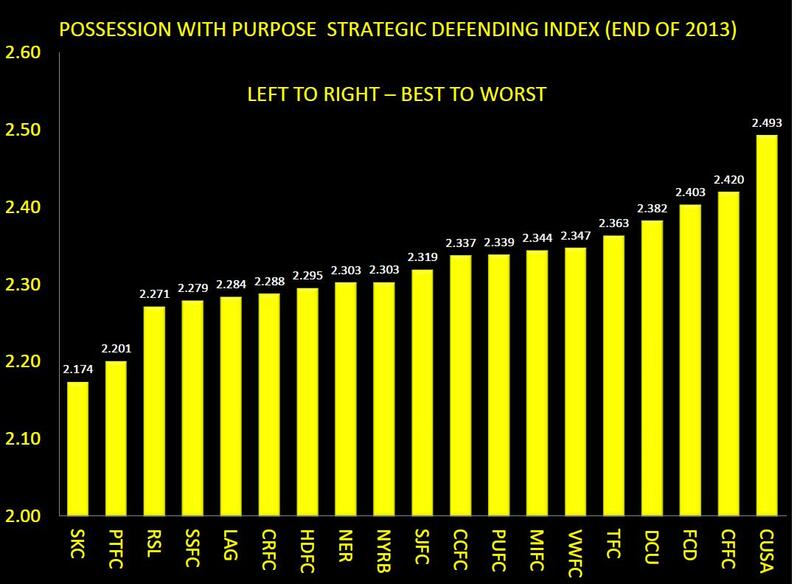 By contrast, the Goats PWP Indices (at full strength this year) for Attacking = 2.1685; for Defending = 2.5446 and for Composite PWP = -.3760. If I were a Chivas USA supporter that is a pretty depressing statistical output - FC Dallas, short-handed, are more productive in Attack and more effective in Defense than a full-strength Chivas... wow! After nine full weeks of MLS here's how things stand with my Composite PWP Index along with a few quick thoughts plus the Top 3 in Attacking and Top 3 in Defending. LA Galaxy remain atop the table even with their 1-nil loss in Colorado - if Robbie Keane hits that PK, LA doesn't drop one point. As for Columbus they drop down to 3rd with Sporting KC pushing up to spot #2. Seattle, FC Dallas, Colorado and Columbus still stay in the top 6 while RSL continues to move forward - inching one space higher into 7th with New York and New England swapping places. 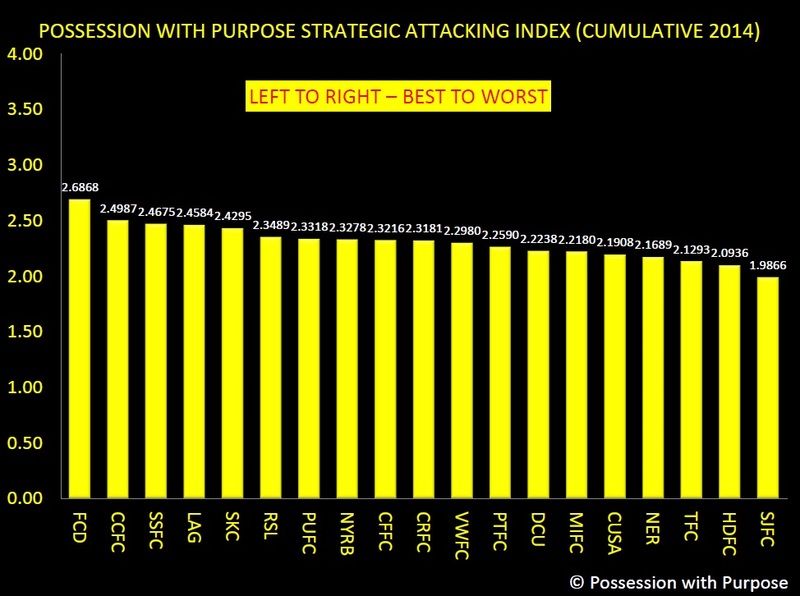 The top three teams in overall Attacking PWP (after 9 full weeks) are FC Dallas, Seattle Sounders, and Columbus Crew - can their approaches in possession continue to keep them there? The top three teams in overall Defending PWP are Sporting KC, LA Galaxy and New England Revolution - some might offer elsewhere that it is surprising to see the Revolution somewhat higher in the table compared to others; is that surprising? Early indications show it may be at least a four-horse race (at the near quarter-mile post) with FC Dallas, Columbus, Sporting, and LA leading the way. Other favorites as Week 8 begins should include Colorado, Seattle, Real Salt Lake, and maybe a real sleeper (statistics wise) Toronto. Note any early-season favorites missing? The obvious here are the two incumbent conference champions, New York and Portland. Defensive woes highlight their early season takeaways. New York's stategy last year (get more goals than the opponent) has only worked once this year and Portland's strategy, patience and accuracy in their possession with purpose has taken a back seat to the poorly performing back-four. And in this case, even though four goals against come from Penalty Kicks (set-pieces) what that really means is the back-four (and some defending midfielders - Zemanski in particular) have not done their job. If PWP is new to you here's a link to the Introduction and some explanations - another link that may be useful is my new Expected Wins (XpW) article getting down to the basics - winning and the tendencies of teams that win. Prime movers this week include LA Galaxy dropping three places with that draw to Vancouver and two goals scored per each team. Others taking a hit to their Index rating were DC United dropping two places with their hard fought draw against Columbus; Portland with that gut wrenching loss (superb saves by Rimando) away to Real Salt Lake and Montreal - a continued drop of two places after getting spanked by Sporting. Bottom dwellers continue with San Jose and Chivas moving nowhere - while some might feel keeping Chivas (with a new name) in LA is a good thing I'd offer that moving them out may REALLY help kill the stigma of them simply not being a team that will compete regularly for a Playoff position. Maybe St. Louis or some other city is better placed to host that organization? Anyhow, FC Dallas, Columbus (almost by default) and Sporting KC all moved up a notch at the expense of LA while RSL continued their move up the Index as they leapfrogged Vancouver, DC United and Philadelphia. Bottom line in this is that some teams continue to jockey for overall position but the moves up and down were less dramatic, as a whole, this week, than in previous weeks. Solid play breeds confidence and confidence breeds success. Can anybody really question Pareja's approach in Dallas so far this year? Probably not - a Toronto side came to town with their brand of away football and came away with nil-pwa. Of the eight top attacking teams seven of them exceed 50% in possession percentage with Real Salt Lake (49.77%) being the lone wolf; go figure that one?!? That being said four of their first seven have been away games and three of those four away games saw them at ~49%, 43%, and 45%. Teams making the most effective use of penetration into the Atacking Third are New England (~29%), Houston (~24%), Philadelphia (~23%), and Columbus at (~23%). Bottom dwellers in percentage of total passes inside the Attacking Third are Montreal (~17%), Colorado (~17%) with Sporting and FC Dallas at (~18%). A good indicator for Portland (based upon last year's averages) is that 18.83% of their possession has been in the Final Third. What has lacked is controlling individual mistakes and positional play in Defense. Will Johnson had some frustrated words to offer after that loss in Real Salt Lake (that I won't quote) - hey - give the guy a break - he's a fierce competitor and like most any of these guys he simply hates to lose... but he's right; professionals get paid to put up their best in tight situations. Other top performing defending teams include LA, Colorado, Columbus and New England. A continued presence by DC United should give warning that Olsen seems to be doing better in stopping their goals-against rot from last year. Is it Boswell who's made the overall difference? In looking at the tail end both Chivas and Montreal continue to wallow at the back of the pack while Chicago, under Yallop, can't seem to gallop at full stride yet either. 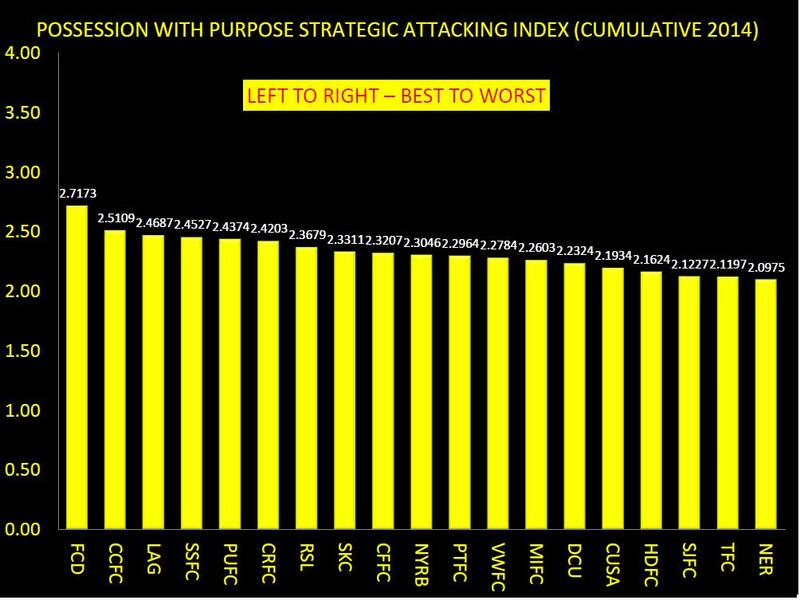 A few other notables here; FC Dallas, Seattle and Real Salt Lake are in the bottom ten on the defensive side of the pitch - that strategy was an indicator of New York simply outscoring their opponents. A run of bad luck, shoddy shoes, dodgy goal keeping, or getting hamstrung with injuries could have a huge impact in their overall outputs. The teams that should scare people the most are Sporting and LA Galaxy... and with Colorado and Columbus looking to gain confidence (and chemistry in their attack) they too may put paid to rest this idea that a team can simply win more games by outscoring their opponent. That approach got New York the Supporter's Shield last year but not the Championship - I think the teams going for it this year want the Championship and/or first place in their respective Divisions'. The plot thickens as does the muck and the mud on the track at the first turn in this yearly Derby. Hurdles await as does time spent at the World Cup, where the stakes for some players are so much higher than others. Looking forward to an exciting weekend of MLS, and really wish the DC United match against FC Dallas was televised on National TV! Over the two and a half years I've been developing Possession with Purpose you've heard me go on about this game not just being about scoring goals it's about winning. I don't mean that in the sense that you don't need to score goals to win; you do. But what separates winning from losing statistics wise? And if there is separation, what is it, and what value does it bring? While 2% difference in overall Passing Accuracy might not mean much it should be noted as a reasonable indicator on how well a teams' Passing Accuracy will be in penetrating the Final Third. In looking at Passing Accuracy within the Final Third there is a clear difference between winners and losers; winning teams are 9% better in Passing Accuracy within the Final Third... this is not about volume of passes - it's about the accuracy of those passes. The "x and y" axis represent the same things as they did in the first diagram. The Blue, Green, Yellow and Red lines represent the averages 'in trend-line format' seen in the above diagram with their corresponding exponential correlations. That tight difference in R2 means there is a very tight margin of error between winning, losing and getting a draw; and if you've watched a game you know a single mistake can cost you three points. 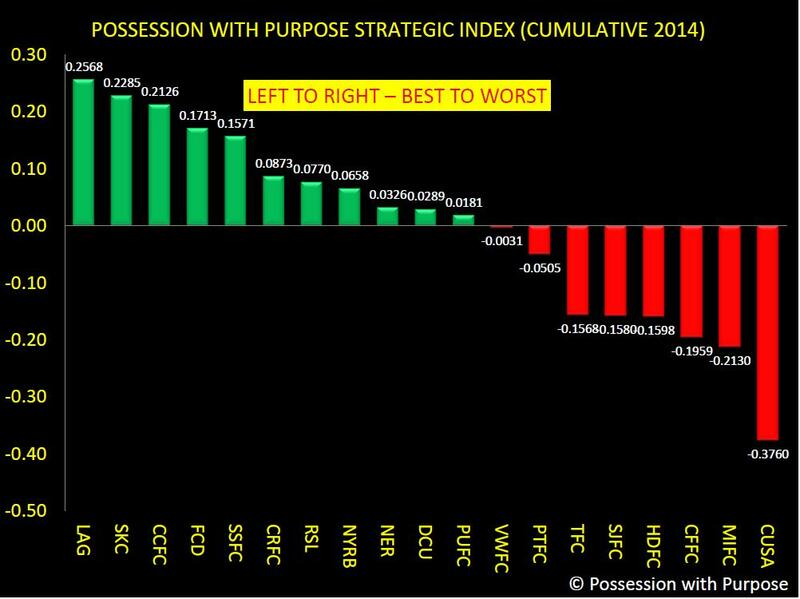 I think so, and while Possession (itself) is not "the" prime indicator on whether a team wins or loses it is "an" indicator that should be considered, when viewing overall passing accuracy within and outside the Final Third. Perhaps another view that may be helpful to others is the 'space available' that gets leveraged in creating that goal scoring opportunity? I don't know if this data is representative for teams in Europe - but the data certainly supports that view for teams in Major League Soccer. Only one of those teams made the MLS Playoffs - Montreal. In all this I've not talked anything about defensive play... more later this year on how teams perform without the ball with specific focus on defensive efforts (collectively and by individual defensive action) within the Final Third. And does the general formation they play to (advertised as 'the formation' in the MLS recaps) show results differently in how a defense performs? My intent will be to answer these questions, and more, as the data piles up (figure once the 17 game mark is reached, for most MLS teams, I will have enough to offer a reasonable view on what is and isn't of value. 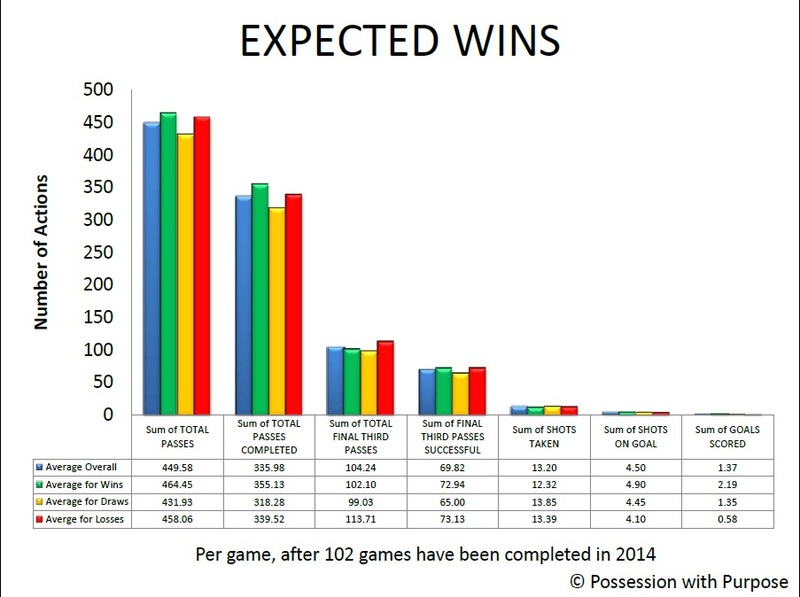 With respect to the data discussed here - I have the 102 games here and the 646 games from last year. This year, at this time, the overall Correlation of that analysis is an R2 of .7658 - the R2 for Goal Differential is .8729. 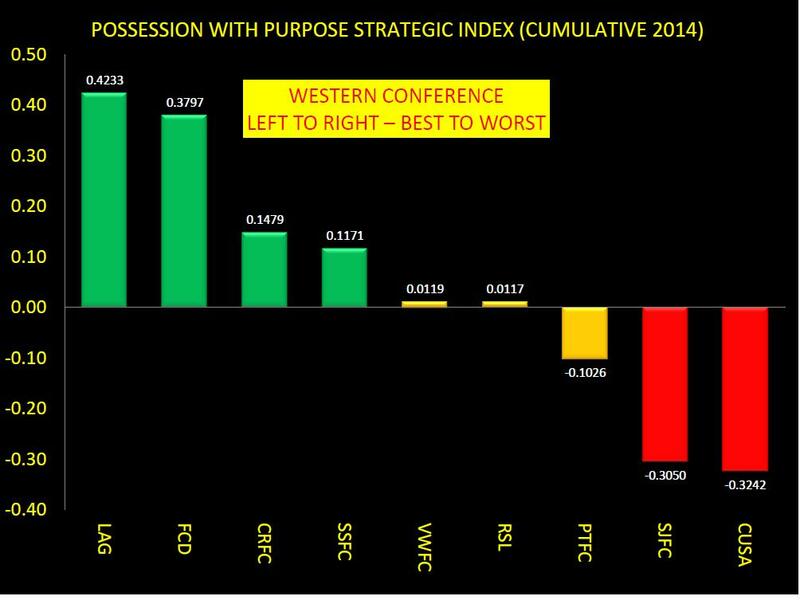 How this plays out by the end of the season is unclear but as a reminder the overall PWP Composite Index was 90% accurate by the end of the 2013 in showing what teams would make the playoffs and what teams wouldn't. Starting for Week 8 my PWP-Pick-List will offer up my prognostications about a team either winning or losing... no more draws will be offered up as no one team ever goes into a regular season game wanting to get a draw. A draw is good but the intent of a Head Coach is to win first. 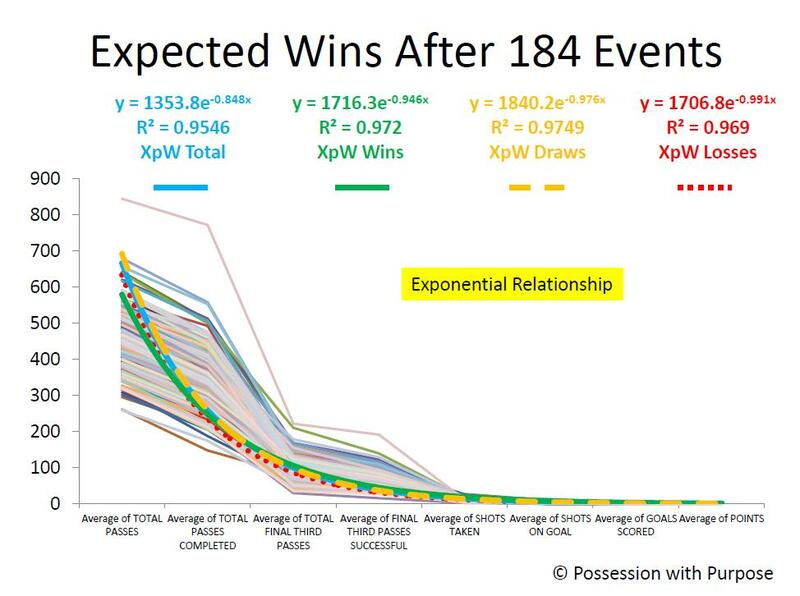 Expected Wins is all about what it generally takes to win a game versus lose a game; it's not about getting a draw. Expected Goals is an 'effect' relative to Expected Wins and the 'causing' relationship between those seven data points; i.e. the combined effort of a team as it possesses, passes and penetrates with purpose. Hence my phrase offreed up some time ago "quality beats quantity". However viewed, teams play to win and score goals. Various strategies and tactics may be used depending upon location, game state, game conditions, team formations, player selections, or what's needed to move on, if in a knock-out or other tournament type condition. You might not think that six weeks is enough to begin to categorize what teams are performing well and what teams aren't - I may even agree with you to an extent, but here's the thing: we're six weeks in, and patterns are beginning to take shape. Instead of just showing the combined Index for all 19 teams I'm going to split them up into the Eastern and Western Conferences to show a different view. And here's my link to the Introduction to PWP. 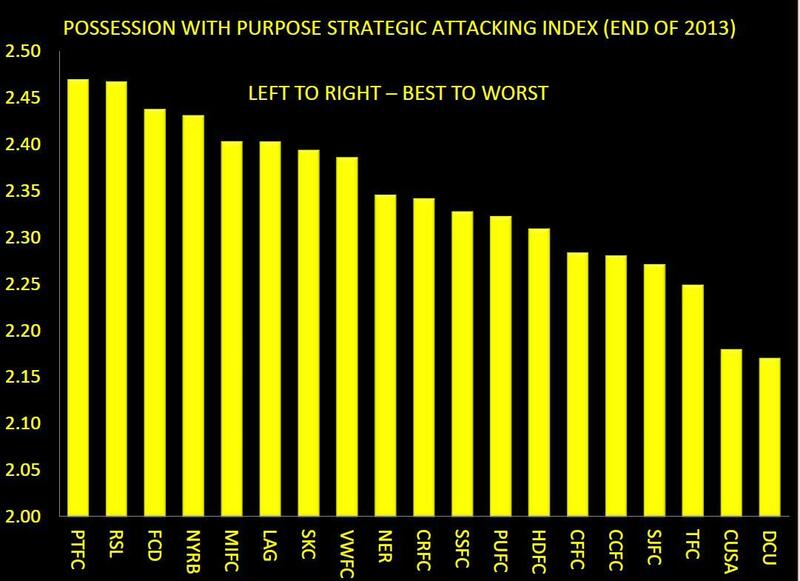 The intent here is to offer up a graphic that shows which teams are performing better in attack than their opponents so far. No intent here to write off anyone, yet... too early for that with 28 games and a maximum of 84 points still being available. Let's just say that Berhalter and Vermes have their teams in top gear - while Hackworth, Olsen, Petke, Heaps and Nelson are still fine tuning... as for Klopas, Yallop and Kinnear performance needs to get better and I'm sure they already know that. 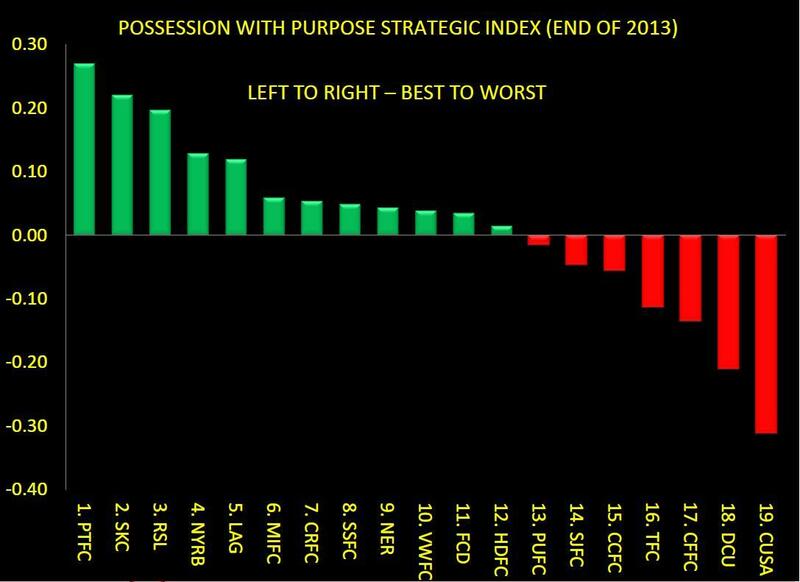 As a reminder - this Index is the difference between how well a team executes the six primary steps of Possession with Purpose versus how well their opponents execute those same steps against them. A negative number thus means that, on average, the opponent is performing those six steps better (collectively) than that team. I'm not a betting man yet on this Index, but if you think the odds are good that Columbus wins the Eastern Conference, then a flutter of $20/20 BPS might be a worthy chance. Spreading your bet across the field with Sporting Kansas City and one or two other teams might be worthy as well... for now I'm not seeing Montreal make it; but that's just me. Like the Eastern Conference, it's too early to go too deep, and the high flying teams play each other three times this year just like those guys back east; when LA and FC Dallas square off it should be interesting... all the while Colorado and Seattle continue to get better, with Vancouver and the ever present/haunting Real Salt Lake looking to make a strong mid-year run. As for Portland - times are hard early on this year and a 15-game unbeaten streak would be a much needed does of medicine to put them into the thick of things. How San Jose and Chivas cope remains to be seen - and given the styles I've seen from them this year, it appears crosses are their primary way to penetrate. If you're a betting guy, I'm even less sure about the West than the east at this point - for now spreading the bets where the odds are good seems a likely choice with LA probably being the front-runner... is this the year where big money shows value in the West, like New York garnered last year in the East? While there is no sure thing if you're looking for teams who are more likely to put goals past their opponents in multiples it's likely the top 5-10 teams are those that can - whether they prevent the same number of goals is a different story. Note Real Salt Lake is in the top 7 here but sits in 6th place overall in the Western Conference PWP - for me that indicates Real are operating pretty much like they did last year; score goals and work harder than your opponent to score more goals while relying on your defense to keep you in the game... without that stoppage time goal by Edu this past weekend it's likely RSL would have been higher up the Western Conference PWP Index. 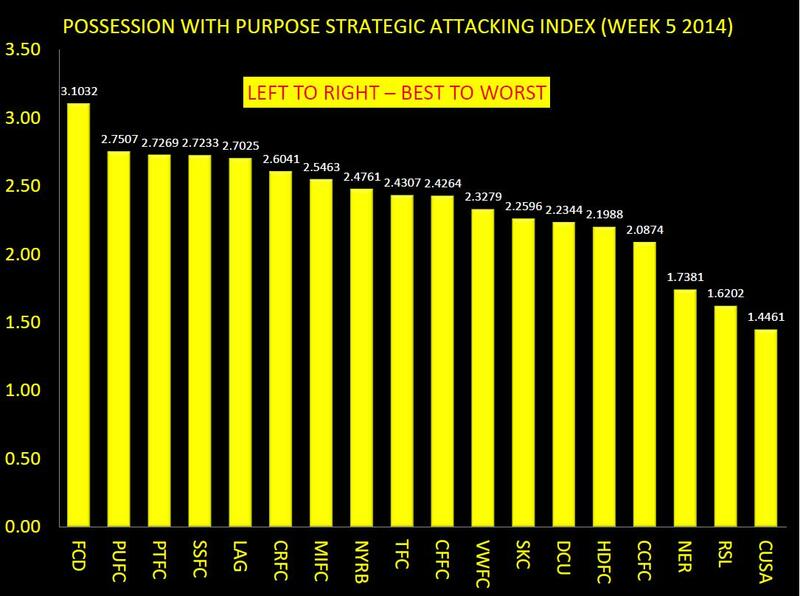 Note also that Sporting remain in the top ten for Attack - they've always been viewed as a great defending side - the higher up the attacking scale they reach the more likely they will be balanced for another run at the Championship. On the other end - New England and Toronto are bottom dwellers here but they are getting points; why so low? In working their own style Toronto have started the season averaging just over 40% of the possession with just 64% accuracy in their overall passing - what we are seeing is timely penetration against opponents who are out of shape, position wise (for the most part) - recall also Defoe has been injured too. Other notable pieces of information - both Columbus and LA are averaging better than 80% accuracy in 'all' passing totals; the teams doing the best in penetrating based upon total passes are New England (29.49%) with Houston, Columbus, Philadelphia and Chicago all hovering around 22%. The team creating the most shots given their final third penetration is San Jose at 26%, Toronto at 25% and Chicago at 25% - can you say counter and direct attack (be it on the ground or in the air)? Not much separates the good from the not so good and perhaps the ugly; and it's too early to label anyone as really ugly. For now the team most successful in holding their opponents to low passing accuracy percentages are Sporting KC (opponents just 70.25% accurate per game) with Real holding opponents to 71.97% accuracy, DC United 71.98% accuracy and Philadelphia holding opponents to 71.55% accuracy. As for allowing penetration based upon overall passes; opponents of San Jose penetrate over 24% of the time while Vancouver also permits opponents to penetrate about 24% of the time. 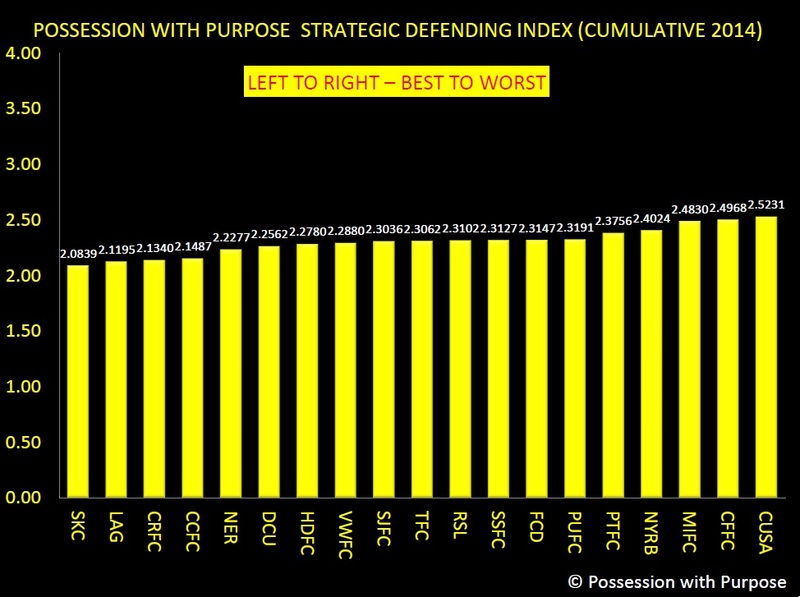 In opponents completing final third passes the team most successful in limiting completed passes in their defending third is LA at 12% while Toronto's defense offers up a stingy 13.57%. Teams yielding the most goals scored per shots on goal, per game, are Chivas at 45% (begging the question: why couldn't Portland score more than one goal? ), Philadelphia at 43% while LA Galaxy allows a stingy 17% of their opponents shots on goal converted into goals scored. Just week 6, but patterns continue to develop - as the season unfolds I'll do my best to offer up these tidbits for your consideration. For the future, I have a post coming up that speaks to formations and defensive activities - still need about 4 more weeks for that one to have enough data to offer some observations on it. And so it goes; another week completed where you got the heart-pounding excitement from the Cascadia Cup clash, a defensive struggle from two of the best teams in MLS, and lopsided victories for two others. Before digging in, a couple of links to consider: if you missed the match between Portland and Seattle here are two articles you may want to read if the opportunity presents itself. This one was offered up by MLS, and then here's mine offered up on my home site here in Portland with the Columbian Newspaper. Also, if PWP is new for you there may be value in reading what that's about through this link, an introduction to PWP and some explanations in case this approach is new to you. With that out of the way it's time for some grist... who was the most effective and efficient team in my PWP Composite Index this week, and who was the worst? To set the table here's my standard diagram for Week 5 only. Later this week I will publish the Cumulative Index - when I do I'll pop that link here. Up until the completion of the LA Galaxy 3-nil thrashing of Chivas USA, it looked like FC Dallas would be top of the heap for Week 5 - and rightly so given they put 3 past Houston plus they got the Orange team to give them an own goal as well. The tough part about the FC Dallas game, for Houston, was the straight red and sending off of David Horst on what the Referee considered was a rash foul down Houston's right sideline. I'm not so sure about that but as we have seen so far this year, the Referee's are stamping their authority with no reservation whatsoever. Spilt milk and, as it goes. Dallas scored three goals within 15 minutes of that Red Card to take three points. If you run a team defense in Fantasy football and have Houston in that role you got hosed - I do and I got hosed in the back-four; still got 52 points though! If anyone wasn't sure about how Landon Donovan could operate in a Diamond 4-4-2, be advised that he can - he has - and he will; when surrounded by other strong players, he's tough to stop. For me, though, this game wasn't about just scoring goals. 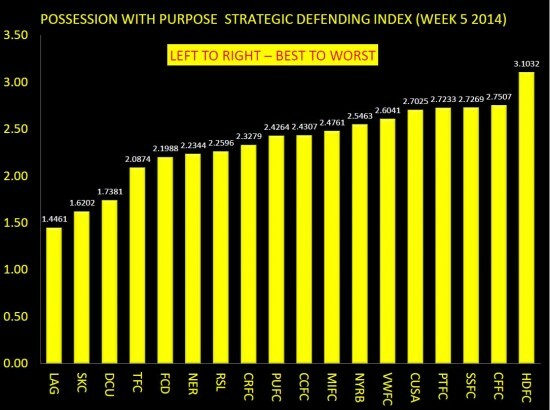 It was also about defense, and it's that defensive mindset that put LA at the overall top this week - clean sheets matter! If it's LA shutting down Chivas that garners the top offensive spot, then it's reasonable the flip side is the complete lack of structure and focus from Chivas that sees them at the bottom. Carlos Bocanegra has great mental awareness, but he can't stop an aggressive Galaxy attack on his own - and in the short glimpses I had of their video it certainly looked to me like Baptiste and others were simply outmatched. 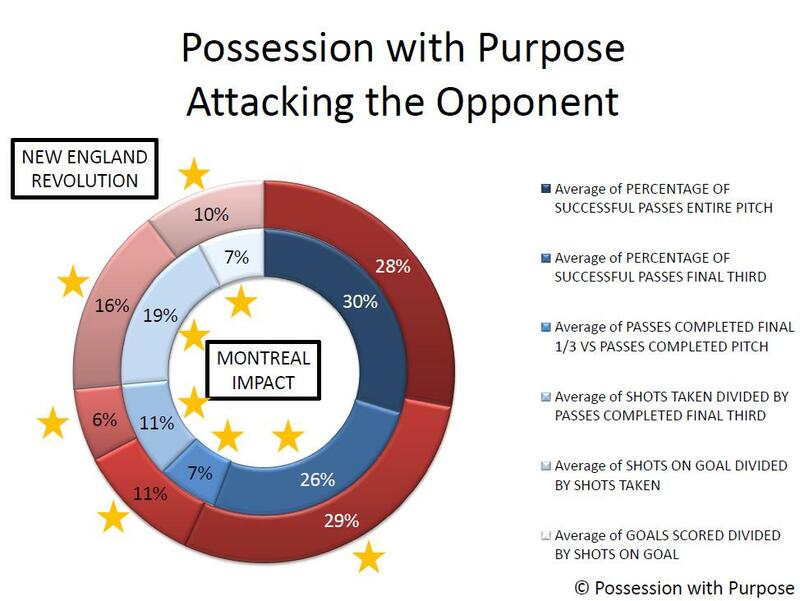 As for Houston - enuf said - the Red Card to Horst directly influenced the outcome of that game. As for the middle of the middle of the pack... if you read my recommendations above about the Timbers-Sounders match, you know that game was all about possession with the intent to penetrate. There was absolutely no possession, that I saw, where the intent was to possess just for the sake of controlling possession. Onwards and upwards - for the first time this year Portland broke the top-five barrier in team attack for a given week, getting two stunners from Diego Chara plus another couple from the Argentina contingent of Diego Valeri and Maxi Urruti. Not to be outdone was the final 20-minute performance of Clint Dempsey - aye - he got a goal early on, but for much of the game his influence and presence was pretty much unnoticed. Indeed, the chalkboard tells us that between about the 40-minute mark and the 70-minute mark, he had just 9 touches of any sort with no shots or key passes. It wasn't until the 70-minute mark where he started to directly influence and impact the game. After that point, Dempsey had no fewer than 18 touches in the run of play with one key pass, three shots on target, and a goal. I'm all for highlighting his hat trick in that game, but he simply wasn't solid through the full 90+ minutes, and his team barely eked out a draw. That may be a surprise to some on two fronts. One - Dempsey got a Hat Trick. And Two - what about Watson or Diaz? Well, as already noted, Dempsey simply didn't play well for a full 90+ minutes and his presence and influence did not prevent Portland from having their best attacking performance of the year. In addition, it's likely Seattle drops three points if Ben Zemanski doesn't do what he did in the box, and I'm simply not in favor of seeing someone getting an Attacking Player of the Week award when his team loses or draws. 3 points is the objective in this game - it's not all about just scoring goals. 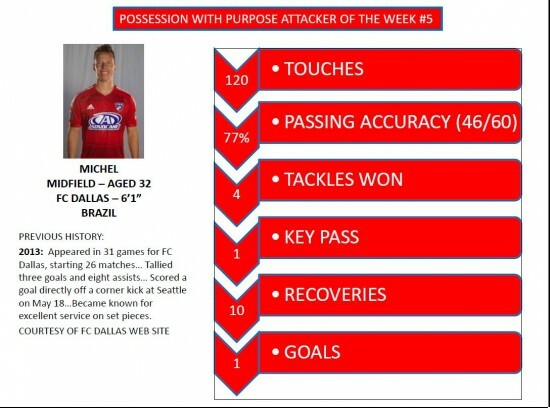 And two - while Diaz is the spark that lights the Dallas attack this year and Watson donated a brace of goals this weekend, I feel and think Michel had more overall responsibility on the pitch; therefore - given his vast number of touches on both sides of the ball I give him the award. And in case you missed it, I don't view this weekly award as going to someone who just lights up the front end without also considering how well they supported the back end. But... alas... the Top PWP Defending team was LA. Why? Well it really came down to how poorly Chivas USA performed against LA, and not how poorly Real Salt Lake performed against Sporting; remember - this Weekly Index does not get influenced by previous performances on a week to week basis only the Cumulative Index does. When checking out my Cumulative Index later this week, you may see a change in who the top defending team is overall - for now though - this is just Week 5. In looking at the player statistics I had considered awarding the PWP Defender of Week 5 to Landon Donovan, and here's why: he had three key passes, five recoveries and an 85% passing accuracy with 2 assists. But the more compelling case fell to Juninho, given his combined efforts (like Michel) playing on both sides of the ball. Week 5 saw some individual players step up and some team performances improve as compared to previous weeks. It's a long season, and it's likely the Cumulative Index will continue to take shape - especially after the (unexpected) Toronto victory over Columbus in Ohio. 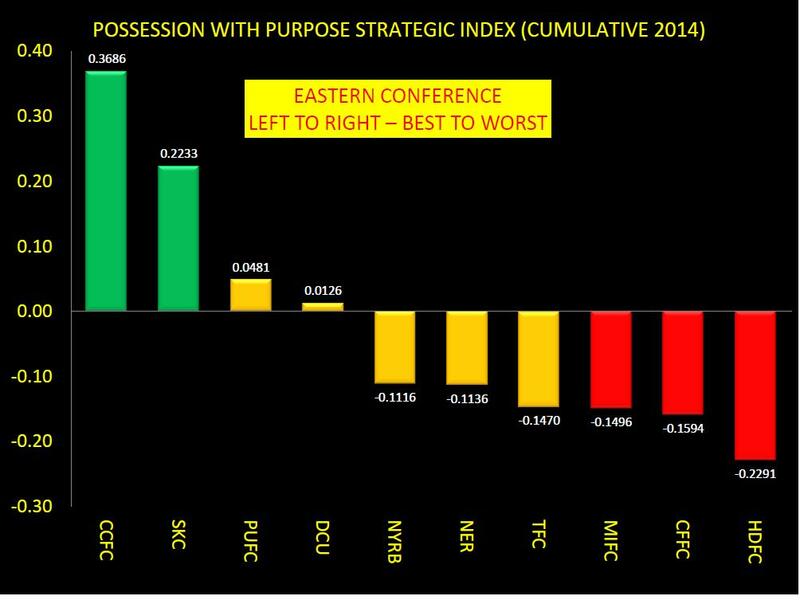 You may have thought that game flew under the radar, but it hasn't, and Toronto will look the better for it in my Cumulative Index... all is not lost when a team gets a big victory without getting the headlines for that week. 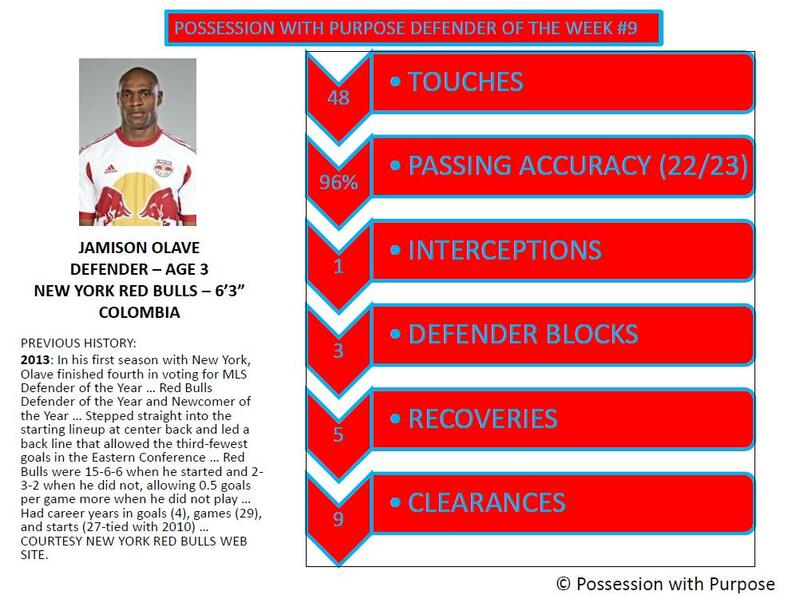 If curious - here's a link to my Weekly PWP analysis on the Red Bulls of New York.